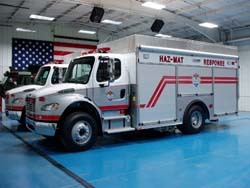 The Adams and Jefferson County Hazardous Response Authority (AJCHRA) is an autonomous government entity created through an intergovernmental agreement (IGA) between the two counties and run by a Board of Directors. The Board of Directors is selected by member agencies and represents cities and towns, law enforcement, fire departments/districts and others interested in hazardous materials emergency response. This partnership has proven to be successful in all types of hazardous material responses by consolidating vital and costly resources. The AJHRA has been successful in obtaining in excess of 1.2 million dollars worth of assets that have been acquired through the grant process. This equipment is a much needed addition to the AJCHRA to ensure the safety of team members and citizens of Adams, Jefferson and Broomfield Counties. Member teams please submit your completed form online. You must have an active account for this site and must be logged in to do so. Team Members please contact your Agency Team Leader to request your account be created through us.